Among many other books, I’m reading Shobha Rao’s collection of linked stories, An Unrestored Woman, and it’s good so far – though I’m on such a history kick that sometimes I forget to return to it. Including it in this photo was my way of giving myself a reminder. 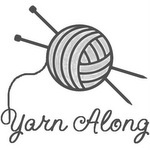 This entry was posted in Yarn Along. Bookmark the permalink. Oh my gosh – the guy smelled THAT bad? I would have moved too! Sweater looks great. I bet it felt awesome to get to wear it. I promise you that he really did smell that bad. He was one for the record books. It did feel great to wear the sweater, and thanks! I like your response, I may have to use that line myself. Lovely sweater. Woo! It looks great! Congratulations!